LanguageCorps: Are you a LanguageCorps English Teacher? Are You a LanguageCorps Teacher? A level of maturity and flexibility to be successful living and teaching abroad. The requirements to teach abroad vary per country. To enroll for our TEFL courses, a university degree or prior teaching experience are not required. In fact, most people have no teaching experience when they start their international teaching career! 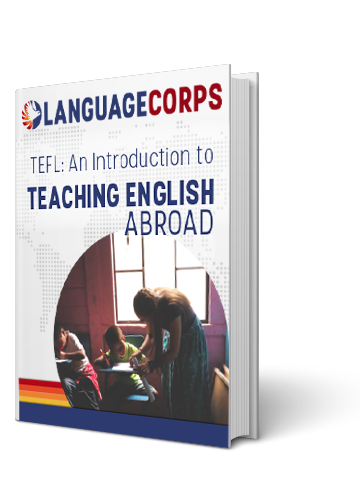 The global demand for teachers is increasingly high, so in many cases, as long if you possess an accredited TEFL certificate, you will find a job. In some locations, in order to get a work visa, the local government does require a 4-year degree. So it’s wise to look into the visa requirements before you choose your destination, especially if you’re looking to stay and teach in the same location after completion of the course. Our admissions team is always happy to further elaborate on this and help you to pick the best location. From our experience, we know that these are key factors that will make your overseas teaching adventure enjoyable and rewarding for you, and valuable for your students! LanguageCorps teachers see themselves as true “global citizens”. They are comfortable with, and excited about genuine intercultural exchange. They embrace opportunities to share their own culture with others, and to immerse themselves into new and different worlds. If this sounds like you, then come join us as a LanguageCorps teacher! Apply now! Still have some questions before Applying?